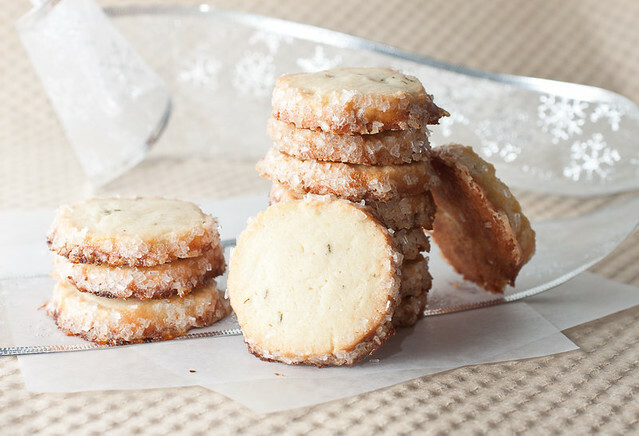 Rosemary butter cookies: Take your butter cookies to the next level! These are flecked with chopped rosemary and encrusted with sparkling sugar. Amazing! A few years ago, I pulled together a round-up of my favorite Christmas cookies and after a couple more years of Christmas cookie baking binges, I could probably put together an entirely new round-up. 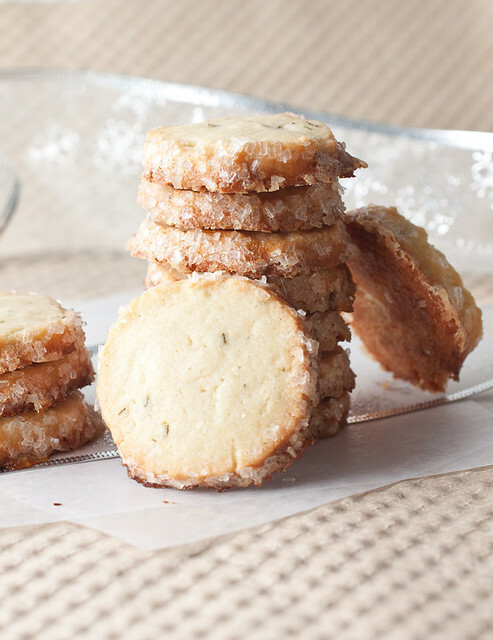 These rosemary butter cookies would certainly be on that new list! These cookies are a lot like the French vanilla sablés I also love. But!! An unexpected addition of fresh rosemary in a traditional buttery sablé cookie yields a sweet and savory treat that will blow your mind. The coarse sugar around the edges adds a little extra crunch and sweetness and with the rosemary, these are the perfect little winter slice and bake cookies! They highlight a hearty herb in an unusual way. Since these are slice and bake cookies, you can absolutely make a batch, wrap the dough logs up in plastic wrap, and freeze them until you’re ready for the cookies. To save you lots of time, you can make the dough weeks in advance. This will definitely help ease the holiday crazies! It will also allow you to give yourself lots of time to plan out your cookie platters and boxes. And boy, could I always use some extra time for that!! In a medium bowl, whisk the flour, rosemary, and salt together; set aside. Add the butter and granulated sugar to the bowl of a stand mixer (or a large bowl) fitted with the paddle attachment. Beat the butter and sugar until light and fluffy, about 2 minutes. Beat in the whole egg and vanilla until just combined. Add the dry ingredients from the bowl to the wet ingredients and mix on low speed until combined. Divide the dough in half and place each half on a 16 x 12-inch piece of parchment paper. Shape each piece of dough into a log about 1 ½ inches in diameter, using the paper to roll and shape the dough. Seal up the ends with tape or tie with a rubber band and freeze for at least 1 hour. If you want to freeze the dough longer, transfer the frozen logs to a large zip-top bag; dough will keep up to 2 months. Preheat the oven to 375° F. Line 2 baking sheets with parchment paper. Pour the coarse sugar into a long baking dish. Brush one dough log with some of the beaten egg white. Roll the log in the sugar to coat the outside fully with sugar. With a very sharp knife, slice into ¼-inch rounds and set the rounds on the baking sheets – 20 rounds should fit nicely on a large baking sheet. They won’t spread too much so don’t worry about putting this many on the sheet. Repeat with the second dough log. If too much of the sugar falls off while slicing, you can roll the edges of the slices in the sugar individually. I found this method worked better for me. Bake for 14-18 minutes, until the bottoms are golden brown and the sugar just starts to caramelized where it hits the baking sheet. Transfer the baking sheets to wire racks to cool for 5 minutes then transfer the cookies to the racks to cool completely before serving. Stored in an airtight container, the cookies will keep for up to 1 week. These look so good – can’t wait to try them when we see you this weekend!